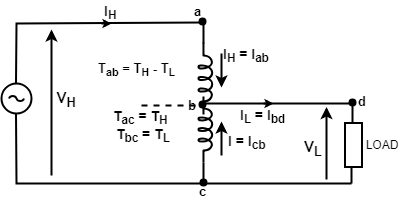 In the figure drawn above 'abc' is a single winding in which terminal 'a' and 'c' is the high voltage terminal and 'b' and 'c' is the low voltage terminal. The winding 'b' and 'c' is known as the common winding and winding 'a' and 'b' is known as the series winding. A step-down transformer is a transformer in which the primary voltage is higher than the secondary voltage. Here in the above diagram voltage 'VH' is applied to full winding 'abc' and the load is connected to winding 'bc'. This arrangement is called as Step down Autotransformer. In an autotransformer, the windings are physically connected that is why a different type of terminology is used for this transformer. 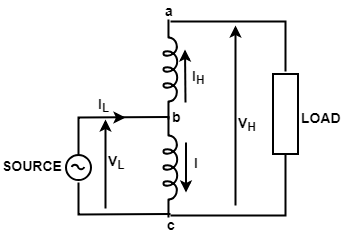 The step-up transformer is shown in the above figure, and we can say that the source is connected to the winding 'bc' and load is connected with the complete winding 'abc'. In an autotransformer, less winding material is used as compared with two winding transformers. Autotransformers are smaller in size. These are cheaper than the two winding transformers with the same output. Because of less use of conductor and core materials, the ohmic losses in the conductor and the core losses are smaller. Autotransformers have high efficiency as compared with two winding transformers. An autotransformer has variable output voltage when a sliding contact is used for the secondary. In an autotransformer, the effective per unit impedance is smaller than 2 - winding transformer. In case of open circuit winding, full voltage is transferred from low voltage side to high voltage side this high voltage can burn out or damage the equipment connected on its secondary side. In an autotransformer, there is a loss of isolation between input and output circuits. Autotransformers are used for interconnecting power systems of different voltage levels like 132KV and 230KV. These are used to boost the supply voltage by a small amount in distribution systems for the compensation of voltage drop. If an autotransformer has a number of tappings than it can be used for starting induction motors and synchronous motors. These transformers can be used as variac i.e. variable a.c. in the laboratory and if a continuously variable voltage is required over broad ranges.